Grey wolves are slender, powerfully built animals with large, deeply descending rib cages and sloping backs. Their abdomens are pulled in, and their necks heavily muscled. Their limbs are long and robust, with comparatively small paws. The front paws have five toes each, while the back paws have four. The forelimbs are seemingly pressed into the chest, with the elbows pointed inward, and the feet outward. Females tend to have narrower muzzles and foreheads, thinner necks, slightly shorter legs and less massive shoulders than males. 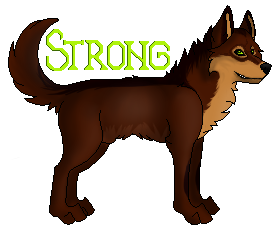 Wolves are very strong for their size, possessing sufficient strength to turn over a frozen horse or moose carcass. They are also capable of running at speeds of 56–64 km (34–38 miles) per hour, and can continue running for more than 20 minutes, though not necessarily at that speed. In cold climates, wolves can reduce the flow of blood near their skin to conserve body heat. The warmth of the footpads is regulated independently of the rest of the body, and is maintained at just above tissue-freezing point where the pads came in contact with ice and snow. The intestines of adult wolves measure 460–575 cm, the ratio to body length being 4.13–4.62. The stomach can hold 7–9 kg (15–20 lb) of food and up to 7.5 litres (8 U.S. qt) of water. The liver is relatively large, weighing 0.7–1.9 kg (1.6–4.2 lb) in males and 0.68-0.82 kg (1.5–1.8 lb) in females.